Literarily from the word "public health", a lay man can ordinarily say it is the aspect of health that deals with the general public. From the two words, they are appear self-explanatory. In this post i shall be taking you a little bit deep, i.e. i shall be giving you an insight of what public health is all about. The knowledge derived after going through this post will serve as a plus to the basics you have already known about public health. Public health is defined as the science and art of preventing disease, prolonging life and promoting health through organized efforts and informed choices of society, organizations, public and private, communities and individuals. Then the last one is that it involves organised effort from both the organisations involved and the general society. 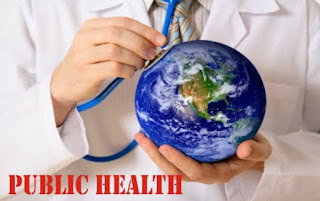 Conclusively, we can say that public health public health involves the protecting and improvement of the health of families and communities through the promotion of healthy lifestyles, and also by conducting research for disease prevention, then the detection and control of infectious disease. In all, the main concern of public health is to protect the health of an entire population. These populations could be as little as a village or as big as an entire country, or the whole wide world in particular. Public health incorporates the interdisciplinary approaches of epidemiology, biostatistics and health services. Environmental health, community health, behavioural health, health economics, public policy, insurance medicine. Mental health and occupational safety and health are other important subfields. You have seen the definition of public health and a little insight of what it means. You have also gotten an idea about it modes of approach, now the next question will be, what is the main focus of public health? Read on! Public health intervention have a major and direct focus, and which is to improve health and quality of life. How can this improvement of the quality of life be achieved? It can be achieved through prevention and treatment of disease and other physical and mental health conditions. This is done by carrying out surveillance of cases and health indicators, and also by the promotion of healthy behaviours. Physicians who are specialized in public health/community health medicine/infectious diseases. The world health organisation (WHO) is the international agency that coordinates and acts on public health issues in whole world. Most countries, therefore, have their own government public health agencies (known as the Ministry of health) which responds to domestic health issues. Various Non-governmental Organisations can also be found in different countries of the world, all thriving towards the health and safety of the populace. In conclusion, Public health plays an important role in disease prevention efforts, both in the developed and developing countries. And just like i have stated before, the two systems involved are both the local health systems and non-governmental organisations.